The Places and Spaces of Fashion, 1800-2007 brings together art, design, fashion, and a much neglected concern for its spatial realities. The spaces and places of fashion have often been overlooked in the writing of fashion history and visual culture. More often than not, however, these environments mitigate, control, inform, and enhance how fashion is experienced, performed, consumed, seen, exhibited, purchased, appreciated and of course displayed. Space, as this volume attempts to illustrate, is itself a representational strategy on par with and influencing the visibility and visuality of fashion. Innovative and challenging, the essays in this volume explore various physical and conceptual spaces, moving from physical environments to the two-dimensional with paintings, illustrations, and photographs to chart similarities, differences, and complex nuanced relationships between environments, fashion, identities, and visuality. The volume also navigates various sites (both permanent and temporary) of production, circulation, exhibition, consumption, and promotion of fashion that define meaning and knowledge about a culture or individual by providing for a bond between embodied consumers/spectators and fashion objects. 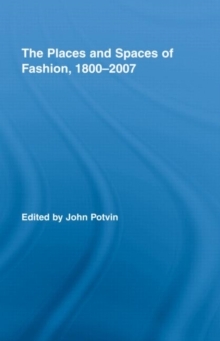 The Places and Spaces of Fashion, 1800-2007 is a compelling project with a thematic, theoretical, and historiographic approach that is at once both focused yet far-reaching and original in its implications. The volume engages with questions attending to the `modern condition' by seamlessly weaving interdisciplinary discussions of the visual with material culture to explore the spatial dimension(s) of fashion.